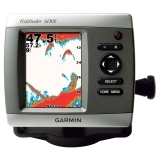 The 400C is available with a choice of dual beam or dual frequency transducers, so it's readily adaptable for both freshwater and saltwater fishing. The 400 watt (RMS) dual beam version offers a wide fish-finding cone and reaches depths of 900 ft (274.32 m). With the 500 watt (RMS) dual frequency transducer, you can reach a depth of 1,500 ft (457.2 m).